The Standardsetting the standard for comfort, style and versatility. The Standard by Bullard takes style and comfort to a new level. A low-profile shell, along with Bullard's 3-rib design and patented suspension system, provides maximum comfort with a look workers prefer. The Standard Series of hats is available with two nylon suspension options; self-sizing ratchet. Both suspension styles have large, pillowed, replaceable brow pads. Models S61,S62, and S71 come standard with a cotton brow pad. Model S51 comes standard with a poly brow pad.The Bullard patented Flex-Gear ratchet suspension is designed with built-in flex points that allow the ratchet housing to conform to the back of the workers head, ensuring a snug, comfortable fit. The nape cushion adds to the comfort and overall fit of the suspension.Easy to adjust vertical height settings, two front and two rear, provide a customized fit which will increase wear time and worker compliance. All vertical height adjustment settings ensure that the hard hat remains centered on the head.The Standard is also offered in a vented design (Model S62). The vented model offers increased air circulation, resulting in optimal worker comfort. The low profile shell design of The Standard cap combines a perfect fit with a look that workers prefer. 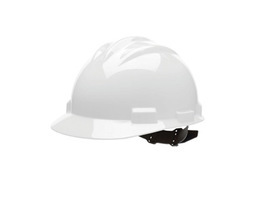 The sleek, trim shell profile is the most stylish in the industry.The Standard Series also includes a full-brim style (S71) for additional protection from exposure to sun and rain.Hard hat colors can be used to identify different job functions, trades, or departments within an organization. With this in mind, Bullard has chosen 14 of the most popular shell colors for its standard color offering. Many custom and special colors are also available upon request. Contact Bullard's CustomerService department for details. The Standard series hard hats come equipped with accessory slots for mounting a variety of attachments including face shields, welding helmets, earmuffs, and headsets. Brow pads on all Standard Series hard hats are replaceable. Replacement brow pads can easily be snapped on in place of, or over the original pad. This feature combined with the choice of vinyl, cotton or a special cooling material ensures the right comfort level and protection for the wearer. Bullard model S61 conforms to all OSHA and ANSI Z89.1-2003, Type I, Class E & G requirements, including impact, penetration, and electrical insulation.